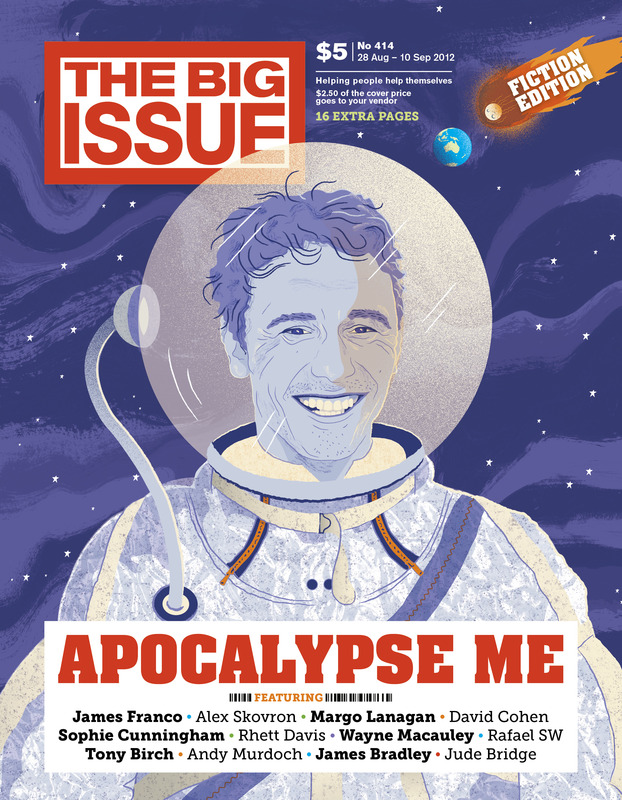 I’ve got a story in the new Big Issue, which hits the streets today. Entitled ‘Solstice’, it’s part of the magazine’s annual Fiction Issue, which this year is focussed on fiction about the end of the world. I’ve not had a chance to read the whole magazine yet but since it features stories from writers of the calibre of Margo Lanagan, Miles Franklin shortlistee Tony Birch and Sophie Cunningham, as well as an essay by the depressingly multi-talented James Franco I’m sure it’s brilliant. Of course it’s always a buzz when a new story goes out into the world, but I’m particularly pleased about the publication of this one (which is set ten minutes from now amidst the melting glaciers of Antarctica) because it’s also the first part of the novel I’ve been working on for the past few months, and which I’m very, very excited about. So what else can I say but do yourself a favour and grab a copy of the magazine today? After all, how often do you get to grab a pile of great stories and help people who really need it at the same time? Thank you – now I just have to finish the damn thing! It’s frustrating that overseas readers don’t get to read the story, since the magazine doesn’t offer an e-edition. Somebody ought to advise them to join the 21st century. Is it possible that you make the story available for those of us who can’t pop out to the corner newsagent’s? I’m sure that there are other readers who’d be willing to pay for a Kindle download, for example. Usually I’d say something similar, but The Big Issue is a bit of a special case because it’s specifically designed to provide a product the vendors can sell. But either way knowing you’re excited to read it is lovely! Yes, at the moment I’m reading The Deep Field with pleasure, but am curious about your short stories too. They’re such different forms, and I must admit that The Inconvenient Dead was less to my liking. But it’s only one story, and I do so enjoy your criticism/blogging as well as your novels.